Last weekend, I took the time off of work and went to the sewing expo in Overland Park. (I won’t be going back until December.) I took several fit and pattern alteration classes. Hopefully I can apply what I learned to my up coming projects. Saturday morning was my one hands-on class which I made the e-Shrug on a serger to learn and get over fear of serger. While there, I did make a big purchase. I got a new sewing machine. I picked out a Pfaff Ambition Essentials. It is on order now. I can’t wait for it to come in. Otherwise, I really don’t have anything else to post except for possibly some doll clothes for next week. This is probably a very risky project. I decided to make my sister a pair of earrings for her birthday. The risk wasn’t actually making the earrings but just the fact that I am not sure if she will like or even wear them. There is relevance in the title. I worked on this some over break at work. Afterwards, someone came to my desk and told me there was a large spider on my desk. But it was just the earring I had been working on. 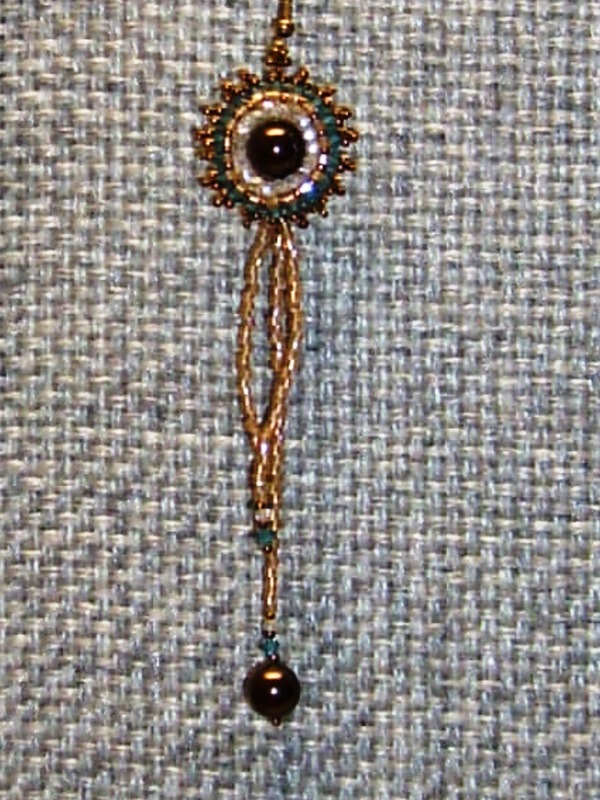 I used the center component from the Nebula pattern in Bead and Button’s February 2011 issue. All the beads were already in my stash. None of the beads in the pattern are very hard to find (except maybe the 2mm crystals because I can only find them online). I added the additional dangles from the bottom to have more of a chandelier effect. Apparently the scrap box is way bigger than I expected. As I was cleaning and organizing the craft room, I was able to fill an entire 70 gallon storage container with scrap fabric. I really need to start getting this monster under control. I did find a hand cream I had picked up for my mom stuffed in one of the scrap fabric bags. I spent part of my week cutting multiple doll clothing patterns and a top pattern for myself. I also asked my dad to make me an amoire for my doll clothing. I am not sure if I am going to get that since he rolled his eyes at me as I asked. The shorts are from Eden Ava Couture’s 1940s play suit pattern. The pattern also has two versions of tops and a wrap skirt. The shorts only have three pattern pieces. The back waist has elastic in it. 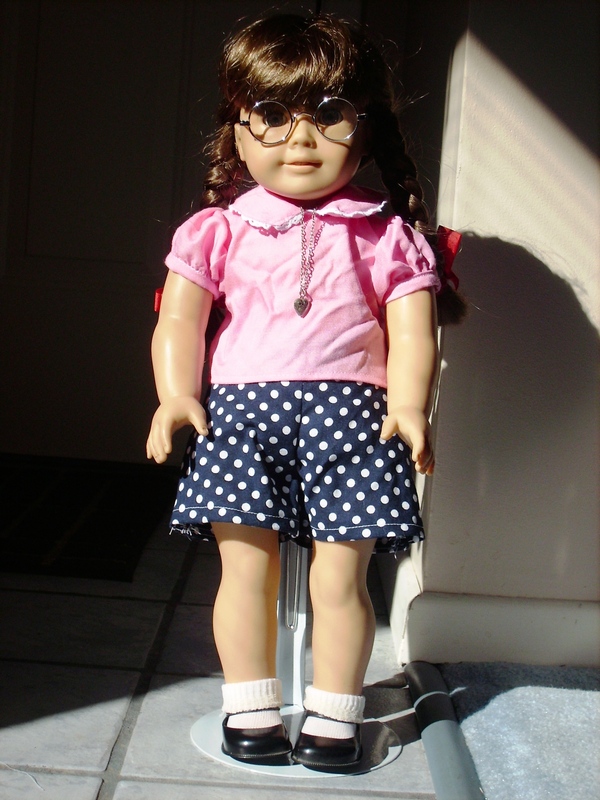 So I figured with the elastic, the shorts should fit fine on my doll. I didn’t do any pattern adjustments. I went ahead and cut out a couple different sets and one night just factory lined several pairs. The construction of these shorts are very easy. The top is from Heritage Doll Fashion’s “1950s Sock Hop” dress pattern. The pattern suggest using cotton. Rummaging through the scrap box yielded a pretty pink rayon Challis. I decided to use that. The fabric may be a little too drapey for the pattern. I was able to get a roll of thin lace at the craft store for half off of a couple of dollars. For the top, I did go ahead and add in a quarter of an inch to the bottom hem line width. I tapered it back to nothing at the arm opening. Maybe I don’t have the best fine motor skills. But it was challenging getting the lace a quarter-inch in so it sticks out on the collar pieces. I may try getting wider lace so I just have to line it up at the edge instead. When I make the blouse again, I definitely will reconsider the facings. The back may not roll out as easily, but I feel like the front may roll out or ripple. I think I would be happier with lining the front and back bodice pieces instead. Putting preference items aside, the 1950s Sock Hop blouse is a well drafted pattern. I definitely need to try the other parts of both of these patterns.